Due to hight demand Holiday Travel India designed this Manali tour with Jibhi Jalori Pass. Package starts from Chandigarh and we are providing 3 nights stay in Manali and 2 nights stay in Jibhi. Jibhi is a little known scenic hamlet in the Banjar Valley or Tirthan Valley of Himachal Pradesh and can be approached from the Chandigarh-Manali Highway. Jibhi is located on one of the most popular routes connecting Manali to Shimla and passes through Banjar Valley (through Jalori Pass). This dreamy town has some extremely beautiful and yet affordable Victorian pinewood cottages for people to unwind and relax. There will be one days trek at Jalori pass during the stay which makes this package unique from other Manali Packages. Option 1: Package Cost: 12,000/-Rs Per Person on Double sharing basis. Latoda hut /Latoda by the River / Eco lodge with breakfast and dinner. Option 2: Package Cost: 13,500/-Rs Per Person on Double sharing basis. Latoda hut /Latoda by the River / Eco lodge 2nights with breakfast and dinner. Option 3: Package Cost: 14,500/-Rs Per Person on Double sharing basis. Option 4: Package Cost: 15,000/-Rs Per Person on Double sharing basis. Note: Tree house for 2nights in Jibhi can be provided at an extra cost of 5000/-Rs for 2nights on total cost. Only for couples. · Accommodation on twin sharing on MAP. · All road tax, state tax, Toll, parking, fuel and Driver Bata. Rohtang Pass taxi charges, Table drinks, airfare, laundry, porter, pony, tips, camera fee, room heater, rope-way charges, entrance charges, travel insurance, personal expenses of the clients or any other expenses incurred due to bad weather, road closure, landslides etc. and anything not specified in cost include. On arrival at Chandigarh airport our assigned driver will pick-up and transfer to Manali. On the way visit Pandoh Dam and Kullu Shawl factory. On arrival in Manali check-in the hotel. Evening at leisure. Dinner and night stay at the hotel in Manali. After breakfast proceed for a full day Manali local sightseeing, visit Hadimba Temple, Monastery, Old Manali and in the evening enjoy A walk on Mall road Manali. Dinner and night stay at hotel. Today after breakfast proceed to Jibhi, on the way visit Nagar Castle, Roerich Art Gallery. In the evening visit waterfall. Dinner and night stay in Jibhi. 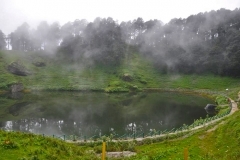 After breakfast, proceed to Jalori pass, from here a guided trek to Serolsar lake. Dinner and night stay in Jibhi. After breakfast proceed to Chandigarh. On arrival drop at railway station/Delhi Airport. Chaini Village is popular for ancient Chinese art and archeological wonder Jibhi Fort. Chaini Village can be reached as a 3-4 hour trek from Jibhi. The trek starts from a point called Chiladhar which is some 4 km from Jibhi on the way to Banjar. There is a little diversion to Sharingi Bagi temple from Chiladhar so you can easily notice that. Sharingi Bagi temple is another major attraction which lies on the mid way. There is a well outlined trail till the temple. The trail passes through small villages, cedar forest, apple plantations, and thin waterfalls etc. The five storeys Jibhi fort is the most impressive building. Indigenous people also reported that top 2 storeys fall down in an earth quake.Rocks used in the foundation of this fort are not found in this region hence its early development is still a mystery for archeologists. Though Jalori (3120 meter) is one of the highest Motorable passes of lower Himachal Pradesh which connects Shimla to Manali via Banjar Valley. Jalori does not witness heavy snow fall hense open through-out the year. From Jibhi, the first bus to Jalori departs at around 9:00 AM in the morning and takes around 2 hour to reach Jalori pass. Sarehul Lake is some 6 km from Jalori Pass. Sarehul Lake and temple are highly revered among locals of Banjar Valley. Hundreds of pilgrims follow this trail to offer their prayers to the main deity. Pilgrims circle around the lake and drops Pure Desi Ghee on its periphery. Trek to Sarehul Lake is easy trek with some steep points and patches in between. It takes around 2 hour to make it to Lake from Jalori Pass.Most of those were from neighboring villages and were visiting the temple to celebrate a festival. "Budhi Nagin" i.e. goddess of Ghee (clarified butter). Local legend has it that if you pray to the goddess, then you get good quality ghee products. Drive to Jalori pass 12 kms from Jibhi camp and then 3 hours easy trek to Raghupur fort through dense oke trees. A 5-day round-trip covering a variety of landscapes. Starting from Seraj in Jibhi through a beautiful river valley with authentic village atmosphere, dense and enchanting forests up to Seraul Lake. For three days, the trek then continues along the ridge at an altitude between 3200 and 3600m through open meadows and stands of Himalayan oak. Along the way, pass ancient shrines of Hindu deities, and there are magnificent views of the surrounding hills and snow capped peaks of the Great Himalayas. Finally reach crystal mine where you can collect your personal mountain crystal. Plenty of time is allowed for bird watching and an introduction to the local flora. On the last day we descend through thick forest again until reaching Seraj .The best time for this trip is July to September. Enjoy the experience of living in a 'pahadi' heritage home. Doli Guesthouse is built in a classy 'Pahaadi' style architecture and is maintained along with a touch of eco-sensitivity. Tastefully renovated to a 5 room guest house, next door is the cafe and a magic little garden with bridges, river views and abundant roses and flowers. Dolli Guest House is constructed Using no cement, these cottages have been constructed beautifully from all natural materials. The charming and cozy cottages built on the hill side are inspired by Swiss chalets, Yet maintain the essence of true `Pahadi’ architecture. The 4 double-occupancy cottages are made from stone and cedar wood offering a majestic view of the valley. The cottages has a unique kitchenette for those who want to cook their own meals. Dolli Guesthouse is Built solely for the purpose of spiritual growth, this Temple is an unique offering of this place.The Kshatra Temple is a spiritual haven made solely for the purpose of exercise and meditation. With no walls and a cedar pine floor, you feel one with nature as you rejuvenate your body and mind.The Kshatra Temple enjoys wonderful morning light and spectacular views of the valley. Kshatra Cafe:- Our food and service will have you coming back for more.Kshatra Cafe is a homely little nook in Jibhi, adjoining Doli guesthouse. Choose from an eclectic blend of local and international cuisine or try some the fresh bakes from the clay oven as you sit under the open sky or in the gazebo overlooking the river. Our staff is everattentive and eager to please. Healthy Holidays and Rejuvenating Retreats! Simone is an expert natural foods chef and has catered to innumerable groups and retreats. Lunches and dinners can be provided to guests on a prior reservation. And if you’re the culinary type, Simone offers cooking classes as well. The fresh mountain air, sparkling clean water, and life lived at a deliciously slow pace virtually unchanged for thousands of years, will allow you to feel reconnected to nature, grounded and more connected to yourself.Kshatra Retreat Centre perfect place to immerse yourself body, mind and soul in a month of learning yoga, meditation andpranayam. Tags : Tirthan valley, banjar Valley, Unexplored Areas near manali, Jibhi Jalori Pass, Sarehul lake Trek, Chaini Fort trek, jibhi adventure, Magical Jibhi, Unsploit wonder of Jibhi, jalori pass Shoja, Holiday homes in Jibhi. From Delhi it takes around 14 hours to reach Jibhi by road. One can take a overnight HRTC bus from Delhi heading to Manali and get down at Aut, ideally before the Aut tunnel. And from there take a bus or shared cabs heading towards Banjar or Jibhi directly. Jibhi is another 36 Kms from Aut. You can contact HolidayTravel arrange for your travel. With adequate advance booking we can arrange for a vehicle from Delhi or a pickup from Aut. Spring (March and April) - you will need light woolen clothing. Summer (April - October/November) - you will need light woolen clothing. Autumn (October/November - December) you will need light woolen clothing and a warm jacket. Winter (December - March) it is very cold, with chance of snow fall - Please bring appropriate winter gear. In this retreat, The focus is on how to cook for optimal health, what to cook according to the seasons and how to design meals that are nutritious, balanced and delicious.Learn about Indian cooking and how the traditional Indian cuisine has supported a 10,000 year old spiritual civilization.